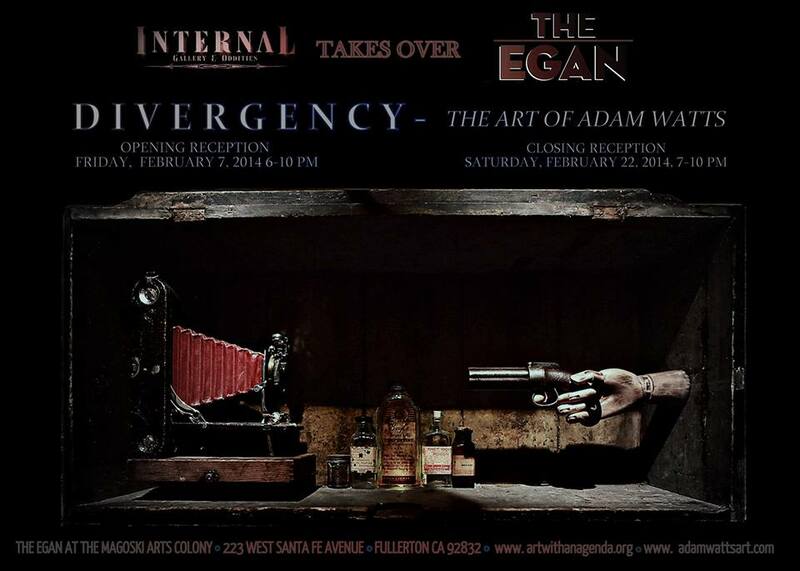 The Egan Gallery (located inside the Magoski Arts Colony) invites you to attend the grand opening of “Divergence”, the art of Adam Watts next Friday February 7th from 6 to 1-0 pm during the Downtown Fullerton Art Walk. If you have not seen the work of artist Adam Watts at his own gallery, Internal Gallery and Oddities, please prepare to have your mind blown when you visit the Egan on the 7th. Adam’s turn of the century assemblage pieces incorporate everything from mannequin parts, the skeletal remains of possums and other animals, old school surgical equipment and Edison filament lighting. This event is open to the public, with free parking and free refreshments. The event is open to people of all abilities and all ages.